Red light therapy for weight loss is a research-based technique that is designed to induce weight loss through the emptying of fat cells. As fat cells are dispersed, the contents are turned into carbon dioxide and permanently removed from the body. This FDA-cleared treatment is completely painless and noninvasive, and most patients will lose at least two inches on the first treatment. It’s an excellent alternative to liposuction. Dr. Matt Thomas is the only doctor within a 500,000-person radius who’s able to offer red light therapy. Used in the U.S. for over 40 years, red light therapy only recently has advanced to provide for fat reduction; it also can be used to tighten and rejuvenate the skin. This state-of-the-art therapy has been used in hospital burn units, as part of “smart” liposuction, and can help to relieve pain. Red light research at Mayo Clinic, NASA, and other notable research organizations has proven the safety and effectiveness of this therapy. Our Photonica Professional red light technology removes fat and reduces inches without risky, invasive surgery. Using 150 modulated high-power red light-emitting diodes, Photonica produces a highly powerful amount of a specific wavelength of red light. The red light tricks the fat cells into creating a temporary pore in the cell membrane, allowing the fatty acids and triglycerides to flow into the interstitial space. The liberated fat cell contents are then drained by the lymphatic system and processed by the liver as part of the body’s normal detoxification course. Patients are usually placed on a consistent, 8-week program that helps them to lose considerable amounts of weight and inches. Red light therapy benefits by helping to boost energy and maintain lean muscle. It has also been our experience that those patients who combine red light therapy with our metabolic program learn new habits of eating, empowering lifestyle habits and a purifying detoxification of major organs. 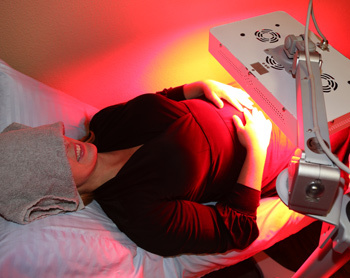 If you’ve been trying to get rid of stubborn belly fat and can’t despite diligently exercising, red light therapy can get you the results you want. It’s also an ideal therapy for those who don’t like to work out or don’t have time to exercise. You simply lie on a table under the light and let the red light do all the work! If you’d like to achieve a trimmer, slimmer body, contact 360 Chiropractic & Wellness today to book a consultation with Dr. Thomas!